Bournemouth boss Eddie Howe has admitted it feels "surreal" that he will be taking charge of his 300th game as a manager at the weekend. Howe, who celebrates his 37th birthday on Saturday, first became Cherries boss in January 2009 and saved them from relegation from the Football League. "It seems really surreal," Howe told BBC Radio Solent. "It feels like it was yesterday when I took my first game." 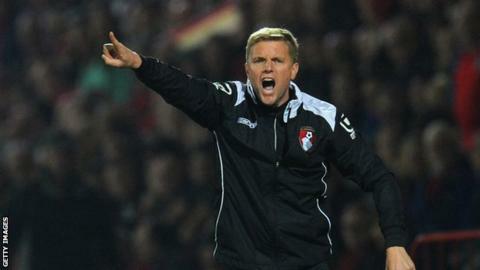 Howe, who returned to Bournemouth for a second spell as boss in October 2012, also managed Burnley for 87 games between the two stints on the south coast. When he initially took charge at Dean Court at the age of 31 the club were languishing in League Two after a 17-point deduction, but he managed to lead them to survival with a dramatic 2-1 win against Grimsby in the penultimate game of the season. "Those memories I have of those days are still very relevant, to say it's 300 games later, it does not feel like that time has passed," Howe said. His side are now second in the Championship and Howe, who also played for the Cherries, said he had enjoyed every moment of his managerial career. "I did have a really injury-hit career and the beauty of management is that I don't have to sit in the stands missing games," he added. "I really enjoy it, it's flown by. I've enjoyed every minute, the challenges and in a weird way I enjoy the stress, the worry and the heartache. That makes it even the more sweeter when you taste success. "When you take the job you are a blank canvas, I had to feel my way into the job. I've changed drastically in terms of the training but the principals are exactly the same." The former defender also said he was constantly challenging himself to improve as a manager and revealed how a blank pad and a diary helped him document previous ideas and come up with new ones. "I keep a diary because I like to look back and reflect and put a new slant on things," he said. "One of the most difficult aspects of the job is to keep things fresh, we hate to repeat things. "The big challenge is to come up with new drills that are actually going to work and there is no better feeling when you come up with an idea you like. A lot of our best stuff comes from us, the home made drills. When you see a problem and identify a drill to solve it that is very satisfying." And Howe admitted he was so immersed in the job at Dean Court and the challenge of Millwall visiting on Saturday that he had forgotten it was his birthday. He added: "I hadn't given it a minute's thought. I'm too involved with the day to day running of the club to worry about a birthday and it's not nice to get older."